This is courtesy of the Temple Institute fb page posted around 20 minutes ago (7:30am Pacific time). Notice in the article he states that they had a SINGLE candidate born last year. They have berm making these claims in the last few months that they have a few of them. That seems to be a exaggeration until today. He also gives the 3 years old date in order to be burnt. This doesn’t line up with rabbi ariels claim of a heifer being ready at 2. But when I talk to those in charge of this in Israel, they say Chaim Richman (Temple Institute) just misspoke. So did he misspoke 20 minutes ago…again? Lastly, these 2 births just happened to ironically fall on or around the Sabbath of the red heifer. “Shabbat Parah (“Sabbath [of the] red heifer” שבת פרה) takes place on the Shabbat before Shabbat HaChodesh, in preparation for Passover. The sages in the Gemara asked, “Why is the passage about the death of Miriam juxtaposed to the passage about the red heifer? This teaches us that just as the red heifer brings atonement, the death of the righteous also bring atonement.” This Sabbath is when the Jews torah portion Numbers 19 is read, the red heifer mandate. I guess it’s easy to plan when you’re a mad scientist. Notice the Jewish scholars compare the death of Miriam (Moses sister) to the red heifer. Not that it matters, but Miriam is a form of Mary in English and Catholics and Muslims both worship a form of Mary in their goddess worship. You can even see this goddess in Judaism with the Shekinah. So her death is “juxtaposed” with the bring about the ashes of the red heifer. In my thinking this is symbolic of Lucifer having 2 forms. The goddess divine feminine in the celestial and the divine masculine man of sin Antichrist in the terrestrial. “Miriams” death is symbolic of this whole thing in my opinion. “MAZAL TOV! TWO NEW RED HEIFER CANDIDATES BORN TO THE TEMPLE INSTITUTE! This past weekend two new red heifer candidates were born to the Temple Institute’s Raise a Red Heifer in Israel program designed to restore the Torah commandment of the red heifer, beginning with the raising of red heifer candidates in Israel. In a beautiful and perhaps Divinely inspired ‘coincidence’ the two red heifers were born over the same week that Jews around the world were reading the special Torah reading of Chukat, (Numbers 19:1-22) in which the laws of the red heifer are conveyed. The custom of annually reading about the red heifer on one of the Sabbaths leading up to the Passover pilgrimage festival is to remind ourselves of the intrinsic role played by the ashes of the red heifer in the observance of Passover during Temple times. The ashes of the red heifer are the vehicle for attaining the highest level of ritual purity necessary for the Passover pilgrims who need to enter into the Holy Temple’s inner courtyard where they are required to perform their Passover offering. The intention of the Temple Institute’s Raise a Red Heifer in Israel program is to renew the ordinance of the red heifer, beginning by raising red heifer candidates, and ultimately providing the ashes used in the purification ceremony conducted by the Temple priests. The two newborn heifers currently appear to possess the necessary qualifications for being red heifer candidates, having only red hairs, reddish skin and hooves, and no scars or blemishes. additionally, red heifers cannot by yoked or put to work. In the upcoming weeks experts from the Temple Institute will conduct a meticulous examination of the heifers to ascertain whether they are indeed, viable red heifer candidates. The date of conception for these 2 heifers would be around June 20-22, 2018. Now I only bring this up because these heifers are genetically modified by the TI’s own admission from past articles. They can plan this out the the day which runs their “divinly coincidence” house of cards. I believe they look to the stars to plan these things and June of 2018 is very interesting. The dates of conception just so happen to have Venus (their goddess in the form of Lucifer) in Cancer or the Crab. 2 heifers concieved, Cancer being the gate of man in the esoteric and representing the 6 and 9 of duality. Here is a article I wrote a few months ago about the Kid who would become King movie. “Cancer has been called the gate of heaven or the gate of man. Bullinger believed this was the sheepfold of the sheep (meaning Christians). I don’t think so. The sign of Cancer, which in the ancient zodiacs connected mankind with Satan and the Underworld which makes more sense to me. Bullinger wasn’t all that. “New Age sources identify Cancer as the “Gate of Men” or the gateway in the heavens through which souls descend into matter, i.e. human bodies. This is the Gnostic doctrine of the pre-existence of souls, i.e. that all humans were once part of a Universal Soul from which certain souls, whether on a mission for the gods or enticed by materialism, descended from their ethereal state into bodies. Read my main paper on Cancer here (https://hiddeninthecrag.com/2017/06/11/69-moons-over-jupiter/). It is all about the red heifer and the arch to bring about the Antichrist. I’ve been saying this for a few years now. I also want to mention how Cancer looks similiar to an upside down cross or broken cross. The Gemini Twins also come into play as far as duality and “twins” goes. I’m only looking at this based on 2 heifers being born around the same time. They both may end up being blemished, we never know. The sun was at the foot of Castor. Remember, at conception the Sun was in Cancer (69) and at birth the Sun is in the Gemini Twins representing andrygony in the occult. If you follow my blog you know what this means. Check out this page about Gemini. Now look at the heavens when they were born. Jupiter is still near the Golden Gate or Gate of the gods in Ophiuchus the restrainers knee and the Sun was in Pisces. Another esoteric duality twist. The Sun was in the fish going Westward which is represented as the Antichrist. How’s that for symbolism? I am one to believe that the signs in the heavens that Jesus talks about will be manifested symbolically and coincide here on Earth. I have written a few things in the last months regarding the Golden Gate which is also known as the gate of gods. Basically, people believe it’s a portal near Ophiuchus’ right knee/foot inbetween Sagittarius and Scorpio. A lot of strange things have been going on there since Saturn left Ophiuchus and we have seen strange happenings take place in Jerusalem. Now a story broke in February about how the Muslims were wanting to break through the Mercy Gate that faces East towards the Mount of Olives. A little history on this gate. It is one of twelve surrounding the Temple Mount area. This is where Jesus made entry into Jerusalem on a donkey. Jews actually believe their “messiah” will ride a donkey through this mercy gate. Ironically they are missing the mark on this one altogether. Muslims took control of the gate and sealed it shut in the past. They went so far as to build a Cemetary there because then the Jewish messiah wouldn’t pass through it because he would be a priest and obviously, the priesthood can’t walk over dead bodies. Jews now say their coming messiah doesn’t have to be a priest so the whole thing is moot. Now Muslims believe when their Mahdi comes that this will be a time of judgment worked out by Isa (Muslim Jesus) and each person will have to cross a single strand hair thin “rope” from the Mount of Olives to enter into this Mercy Gate. If you fall in the Kidron below you obviously have v faced judgement. The rope starts at the 7 Arch Hotel on Olivet that, is owned by the Hashemites of Jordan. Essentially this gate of mercy is also a gate of judgement. Now the interesting thing about this Mercy gate is that it is called the Golden Gate. Now I mentioned that there was a lot going on with this heavenly golden gate. Not only with Saturn but a few months ago we saw what looked like a “stargate” in the vicinity of this Golden Gate. This gate is known as the gate of gods. I think you can figure out what that means. Opposite the Golden Gate is the Silver Gate near Orion, this is called the Gate of Man. The gates for mans acsension and the fallens descension. I think this all correlates with what is happening on Earth. This all started with this gate on Jerusalem on February 22nd. Ironically the false sign of Jupiter was near this Golden Gate in Ophiuchus. You will see a screenshot below where Jupiter is now in relation to King Abdullah making his trek to the Untied States to talk about all of this with Trump. I don’t think it’s coincidence that Jupiter is now near the Golden Gate as this is all going on. This is just another invocation to their god Jupiter to enter his Temple once again. And how do we know that this gate is spiritually significant other than what we are told? “According to Jewish tradition, the Shekhinah (שכינה) (Divine Presence) used to appear through the Eastern Gate and will appear again when the Messiah arrives.” Link is on the screenshot. So The Temple Institute has made a few claims that the red heifer needs to only be 2 years old since the birth of one on August 28th, 2018. I know for a fact that Judaism teaches that the red heifer cannot be sacrificed until it is 3 years old. Not only that, The Temple Institute has said on there website that the red heifer does have to be at least 3 years old or older. That is a main requirement for the heifer. Hit the picture and go to their website. By being 3 years old, it brings it to maturity, but what they fail to see is that the red heifer was a type and shadow of Jesus and the crucifixion. Jesus’ ministry lasted over 3 years and most scholars (including myself) believe this is why the red heifer needs to be atleast 3 years old. Even Maimonides (Rambam), their fearless leader, says it’s to be atleast 3 years old. The age of the heifer is crucial and their is good reason for them to now change it. So someone is claiming that the age of the red heifer is based on the time of conception. Well…that is very interesting if that’s the theory they are sticking too and if that is actually the reason as to why they say that “2” years old is good. Technically, starting at conception does make it just over 3 years old in December. Let me tell you why this is so interesting. In my book “The Temple, The Abomination and The Holy place”, I make the claim that the final 10th red heifer will be the abomination Jesus talks about in Matthew 24. I lay a lot of ground work to get there so if your interested, search on this blog and you can get the pdf for free. A hard copy is on Amazon. Now if this future red heifer is in fact the abomination that Jesus talks about then the date of it being sacrificed and burnt on the Mount of Olives is very important. Im my book I mention December 21-23, 2020 in my book. This is when a rare celestial event happens called the HaDibbuk HaGadol or in English, The Great Conjunction. This conjunction happens when Saturn-Jupiter meet up during the Winter Solstice. I go in depth about this in my book “Their god is Jupiter” and it is connected to the false birth of Jupiter. Now if you remember, this red heifer birth happened on August 28th, 2018. I went back and looked at their beginning date for the time of conception and as soon as I saw it I knew that date was significant. I had talked about it a few years ago. I looked it up on a gestation calender for angus and the conception date came to November 19th, 2017. Now what’s the big deal about November 19th, 2017 you may ask? On the 18th, one day before, Saturn left Ophiuchus after being there almost 2 years. It was actually 96 days short of 2 years. Now the importance of this is crucial in my opinion. Please read this whole thing I wrote a few years ago to understand why Saturn being in Ophiuchus was important. I will give a brief primer. Ophiuchus is represented as the serpent bearer or the restrainer. In my opinion, I believe there may be a connection to what Paul told the Thessalonians about the restrainer with what happened in 2017. And remember, this happened just a few months of the false sign of Revelation 12 on September 23rd, 2017. Everything is connected. Now in February of 2017, Saturn left Ophiuchus for 84 days. Saturn left Ophiuchus on February 23rd and I want to point out that NASA released the information on Trappist-1 and its seven planets on February 22nd, the day before. Trappist-1 was a big announcement from NASA that three was this new system and it was located in Aquarius, the water bearer. These Satanists use code, symbolism and dates to achieve their invocation and indoctrination. This is nothing more than witchcraft in my opinion. So we can see that Saturn leaving in February was planned wth NASA announcing a new system that seemed to have 7 planets. Some equate Trappist-1 wth a sort of seven trumpets connection. Could be I guess if you look at all of this symbolically. So what is interesting is when Saturn left Ophiuchus for good. It was on November 18th. The day before the red heifer was birthed. Honestly, I can’t make this up and if I didn’t write about the significance of Satan being unrestrained in accordance with Thessalonians, I wouldn’t believe it. Like I said, you have to read my book to understand what is happening here. If I believe the unbinding of Satans restraints releases that Antichrist spirit and it happened on November 18th, 2017, then this same spirit was behind the birth if this red heifer on the very next day. What are the odds of Saturn who is represented as Satan, leaving Ophiuchus the Restrainer the day before the Temple Institutes red heifer was born? Please, tell me the odds. Or was it planned all along? This fits 100% into my theory that the red heifer is the abomination of Matthew 24 and the spirit behind it is the spirit of Antichrist. I want to point out one other thing. I don’t get into Gematria much but Jaycoolbreeze brought up a great point. In English Gematria, the red heifer is 666. Interesting right? I also want to show you one last thing. Look at the image below. Why is Taurus the red bull standing on the tail of the serpent in Ophiuchus in this old image? Taurus is in the other part of the sky, nowhere near Ophiuchus. Well it’s not actually Taurus. It is Taurus Poniatovaii. This constellation came about in 1777 (trust me folks, 777 is not a good number in the sense that there is a “good number”) and it was invented by Martin Poczobut to honor Stanisław August Poniatowski (notice his middle name? August) who was the last Polish Monarch. Taurus Poniatovaii or Poniatowski’s Bull was formed from another constellation that fell to the wayside. The River Tigris. Does that sound familiar? The Tigris (Hiddekel-sharp, swift, rapid) was the third of four rivers that went through the Garden of Eden. Daniel calls it the “great river” in Daniel 10:4. So I find it strange at one time there was a red bull on the tail of the serpent in Ophiuchus. Below is the screenshot of November 19th, 2017 ala The Conception of the Red Heifer. The day after Saturn left Ophiuchus. The Birth of Red Heifer. August 28th, 2018. Saturn at the bow of the mighty hunter Sagittarius and Jupiter their false god is at the tip of the scales of judgement. Can anyone see what I’m seeing with all of this? Berkowitz who writes for Breaking Israel News states in this video that the heifer could be ready in a year and a half from March 13th, 2019. This would put us at a September 2020 date around the time of the Jewish year. It still fits with my theory. Rabbi Ariel is the one in charge of overseeing the red heifer calves that are potential candidates. We were told at the end of August that there was a female calf born at that time that could be the sacrificial heifer. A new article came out by Breaking Israel News that now says there are 2 potential candidates. I wonder when the second was born because they didn’t advertise that one. You can see in the photo below one of the calves. Ironically this article comes out at a time Catholic Lent is starting. It’s all about those ashes if you get my drift. In this article he makes a point to say that these ashes are bringing in their false messiah or actually helping by getting the Temple built. We know that to be a lie by the articles we see month after month pushing this same agenda. He claims this is only for the Jews to keep the commandments that they can’t ordinarily keep now. Yeah right! Anyways, he makes another statement that isn’t true. He says the red heifer needs to be 2 years old to come to maturity. I can tell you that the heifer needs to be 3 years old before it can be a burnt sacrifice. I know this because I spent 3 years writing a book on the red heifer and went through countless research papets, writings and their teachings. They pushed up the age of the heifer for a reason. It’s all about a timeline they need to keep and at 2 years this would bring us to their festival of lights. Trust me, they did the burnt offering in the publics view last year around Hannakah for a reason. So people won’t be shocked when they take a 2 year old red heifer on the Mount of Olives to be slaughtered then burnt. Ideally, they would like to have the ashes by 2021 Passover. But to burn it around the great conjunction of Jupiter/Saturn in December 2020 seems to be the tome this could happen. And this actually fits my timeline in my book. So here is excerpts of the article. “Many believe that the search for the red heifer is motivated by a desire to hasten the arrival of the Messiah but Rabbi Ariel stated emphatically that this is not the case. This is a lengthy read. Fair warning. And I have had a lot of problems with this app and my phone when trying to write this. On the 6th day of Sukkot, that fell on September 29th, a strange mist coming out of the ground was seen upon the Temple Mount area in a grove of olive trees. This area from what I’m told would’ve been the area for women in the time of the Temple. It was recorded by Joshua Wander from the Mount of Olives as a group faced the Mount and did their 6th day of Sukkot prayers. Before I get into what my opinion on this means, please read the articles about this event. This first one is from September 30th. (Emphasis is mine) “On the sixth day of Sukkot, a group of Jews praying on the Mount of Olives witnessed a strange mist rising up out of the ground on the Temple Mount, enshrouding the holy site and obscuring the base of the Dome of the Rock. The service on the last day of Sukkot is called Hoshanna Rabbah and marks the end of the week-long festival. The prayer service includes a special service in which seven circuits are made by the worshippers with their lulav and etrog while singing praises of God. This second article is from the same writer from October 3rd. “On Sunday, a group of Jews praying on the Mount of Olives witnessed a large white cloud rise up out of the ground from the Temple Mount. The balcony of Wander’s home overlooks the Temple Mount so he is intimately familiar with the scenery. He is also a regular visitor to the site and said he has never seen anything like this before. “It looked supernatural,” he said. Not trusting his own eyes, Wander asked the people around him if they could also see the mist. Most were immersed in their holiday prayers and had not noticed but when it was pointed out, they confirmed the mist’s presence. The phenomenon lingered on the ground around the golden dome for more than 20 minutes. Okay. So there are few things that I want you to notice about these two articles. First off, the guy’s name was Joshua Wander who filmed this. Joshua is a Hebrew transliteration of Yashua and we know this to be a reference to Jesus. His last name is Wander. To wander means you walk around aimlessly. My first thought is Luke 11:24 where the demonic spirits that roam to and fro in a dry place looking for a place to settle. I think the Joshua reference is obvious here. A demonic spirit posing as a false Jesus on the Mount of Olives (the place Jesus will return).. Wander can also mean a builder. We know who the builders are. Please read this to get a better understanding of the etymology of his name. The next thing I want to point out as the article originally said, was that it was on the 6th day of Sukkot (the Feast of Tabernacles). The second article said it was on the last day of sukkot that they celebrate, which would be on the 7th Day of the feast. I’m just wondering if it was on the 6th or the 7th day that this happened and why is there some sort of discrepancy there? Now as far as the Sixth Day goes, this was on a Saturday which is represented as their Sabbath. And I want to point out that the Arch of Triumph was on its last day in Washington DC at the National Mall. Also remember that this was the sixth city that they placed the Arch at. So we have a connection to the sixth day of Sukkot and the 6th City that the Arch of Triumph was placed at. They said they had seen this mist or now a white cloud after sunrise as they were on the Mount of Olives praying. 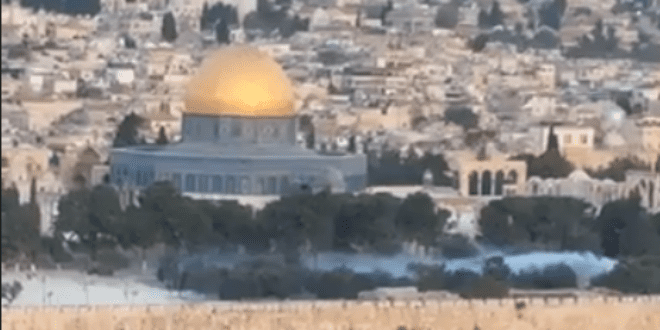 Now if you’ve read my book The Temple, The Abomination and The Holy place, then you know how important the Mount of Olives is in these last days. I believe the Mount of Olives is key to understanding what’s going to happen in the future. Now when this mist showed up, it was at the time of the daily sacrifice that would have been given in the time of Jesus. Please keep that in mind and if you need to go back and reference my article on The Daily sacrifice and what it means, then I suggest you do. Now this mist or what they later called a white cloud is referenced to in Genesis 2 as the mist that watered the garden of Eden. (It also reminded me of an inversion of the great cloud of witness in the book of Hebrews.) The next verse tells us man was created from the dirt. I think this scripture correlates with what happened and it is an inversion of the enemy. What do I mean by that? I believe this mist was a demonic entity manifesting itself in the form of their goddess divine feminine Shekinah. This is the spirit that they copulate with through Davening at the Western or Wailing Wall. Remember that he said it happened in the area that the women would be at in the Temple days. Only problem is that this is not where the Temple was. This is where the Temple of Jupiter was though. We see the spiritual connection again with Jupiter and this divine feminine. Another interesting point in the article is that Joshua Wander was in the Air Force. He specialized at studying the clouds. Most of you may well know that baal and Jupiter were associated with the clouds and is called the cloud rider who makes storms or rain (this will make more sense when I get to their water libation that they were doing). Now what’s interesting about that, is that the Arch of Triumph, which was actually the entrance to both the Temple of Bel and Temple of Baalshamin complex, was set up in the District of Columbia (a goddess reference) at this time. I believe all of this was connected here. There are too many connections to not call it a coincidence. The word mist in Hebrew. This word for mist is interesting. Remember in my paper on the etymology of the word for ashes in Hebrew was directly associated with a bull or heifer sacrifice? Well you’ll like this one too. The word mist in Hebrew is אד and is “from an unused root meaning to gather, shared by אוּד‎ (“a burning piece of wood, a firebrand, an ember”).” In English it sounds like ed. It is a vapor or smoke type of mist. It is made up of a Aleph and Dalet. When this is translated in the symbols of Paleo-Hebrew it looks like this. Now that’s interesting because you have a image of a bull entering or exiting a door along with a fish water reference. Remember when I talked about the Arch of Triumph having a connection to a water entity because of its placement. And while in DC it was inbetween the womb of Isis and the phallus of Osiris. Remember that the exit to the Arch or doorway was facing the obelisk that led out to the Capital womb to the statue of Freedom or the goddess Columbia on top of the building. By now you should know Osiris was represented by the Apis bull in the firm of Serapis at death and the phallus was his missing piece to resurrect. Avid please don’t forget that rabbis believe the sin of the golden calf (Apis) was atoined through the death and burning of the red heifer. Are you seeing the bigger picture here with the Arch in DC and this mist? A water entity was at work while the Arch was set up in DC and we even see this in the Hebrew word for mist. What entity? Well the first one that comes to mind is Dagon. It is drawn from the water through the obelisk phallus exiting the Arch to enter the goddess womb of the Capital, where “Democracy” is birthed. So the Paleo-Hebrew shows us a bull and door translates into a mist that could be from burning embers. Maybe like red heifer embers? And remember, ashes in Hebrew is connected to a heifer or bull. Ironically this mist showed up directly across from where the red heifer will be burnt in 2 years on the Mount of Olives. I believe this mist is directly associated with this burning if the red heifer and the Arch of Triumph. Take note that the dalet or door in the Greek alphabet is a pyramid. And in English it also looks like a door. D. Turn it sideways and it looks like an Arch. Now what is a mist in the occult? In movies we always see that mist on the ground in a graveyard. It gives us a spooky sense of being around the dead or connecting with the dead. But what does the foggy mist mean in the occult. You can watch any paranormal tv show and eventually you will see an apparition in the form of a mist. This is a proven fact whether you believe it or not. In some esoteric circles, they believe the mist to be a veil between worlds. We saw this in the Stephen King series The Mist where they continuously referenced the book of Revelation (the unveiling) of Jesus Christ. So there does seem to be a connection to the mist being a sort of covering. Remember, the original Hebrew word ed refers to it as enveloping something. In Gnosticism and Kabbalah they mention that this mist in relation to Abraham and the Shekinah/divine feminine Kundalini speaking with him. They believe the mist is the sexual force of the mother. “Rabbi Eleazar said to him: But it was the Schekinah (the Kundalini, the serpent of brass), Herself, that spoke to him. Because the Holy One, blessed be He, revealed Himself to Abraham through this grade (of Daath), as it is written: “And I appeared (in Yesod) to Abraham, to Isaac, and to Jacob, by the name of אל שדי El Shaddai,” (Exodus 6:3) Rabbi Shimon said: It is (שד אלי Shed Eli) certainly so. Seest thou not what they do in the cities of Judah and in the streets of Jerusalem? The children gather wood, and the fathers kindle the fire, and the women knead their dough, to make cakes to the queen of heaven, and to pour out drink offerings unto other gods, that they may provoke me to anger. Do they provoke me to anger? saith the LORD: do they not provokethemselves to the confusion of their own faces? I mentioned that there was a Water libation ceremony on Thursday the 27th (or Jupiter’s day), which was the day the Arch went up in DC. This water libation is not mentioned in Scripture but it is mentioned in the Mishnah and Talmud. Now you know why they did this…its not scriptural just like everything else they do. Here is some of the article and notice it was led by 6 men. “On Thursday, a bit of the former glory of the Temple was witnessed by three hundred people who took part in the full-dress reenactment of the Sukkot water-libation ceremony. The group set out from the Dung Gate in the Old City of Jerusalem in the early evening, making its way down the steep steps leading to the Shiloah Spring. Led by six Kohanim (Jewish men descended from Aaron the Priest) and accompanied by music, the crowd sang and danced as they passed from the archaeological remains of the ancient City of David, through an Arab village, to the spring which was used in Temple times. So don’t get fooled by all of the theatrics at work here. They are honoring and pouring out their water sacrifice to their divine feminine. Please read Jeremiah 7:17-19 again. Who were they doing this ceremony for at the time the Arch was being set up in the District of Columbia? And who came through this veil of mist? Their divine feminine that who. Now if this mist is nothing more than a man made hoax, I suggest you read this. Jordan put generators on the Temple Mount last year. Why?